Banjoist, guitarist, singer, and bandleader Danilo Cartia sends his best Season greetings and announces the next edition of the Italian Bluegrass Meeting 2015. The 2014 successful edition held last June, as part of the well-known Acoustic Guitar Meeting that yearly takes place in Sarzana (Italy), saw Tim O'Brien as special guest. Next year's meeting, on May 29, will have just as important guests like Mark Johnson & Emory Lester, and Russ Barenberg. They will give an evening gig on the main stage and, during the day, they will also lead free banjo, mandolin and guitar workshops. A special area will be reserved for the event, with a dedicated stage on wich bluegrass artists and bands will alternate shows, jam sessions and more workshops. All bluegrass musicians willing to participate are invited to register free by sending an e-mail to the organizer Danilo Cartia (banjoman@fastwebnet.it). The workshops are also free but will be held based on a minimum participants number, so do not forget to indicate if you are interested in participating in one or more workshops. 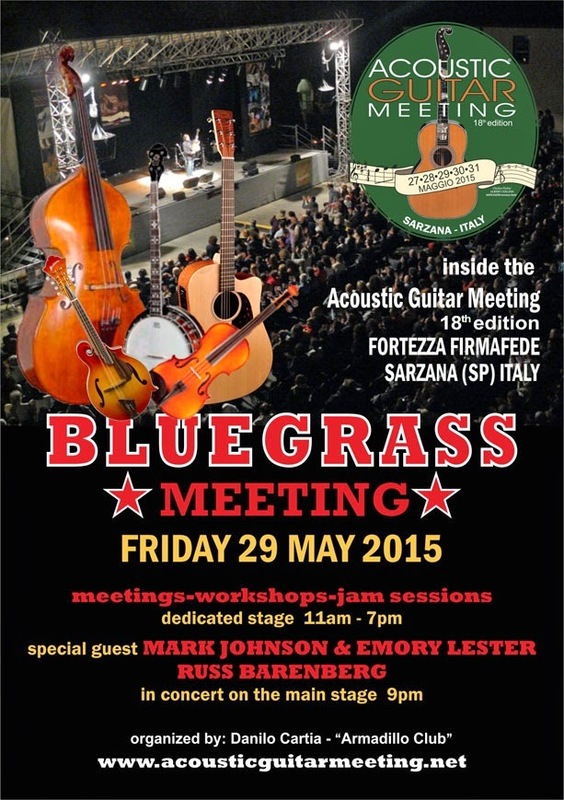 For additional infos you can also join the Facebook group of the Italian Bluegrass Meeting, check the news on the bluegrass meeting blog -- work still in progress on the latter -- or contact Danilo Cartia. So, save the date and make a wish come true, come to Italy and play bluegrass!